It’s a mark of how watered-down Star Wars has become that Tiny Death Star even exists. The villains of the original trilogy, a bunch of faceless, menacing, planet-destroying quasi-fascists are here rendered down into cutesy 8-bit form, as you’re asked to fund the construction of the planet-destroying battle station by turning it into a residential/commercial emporium. Yeah, someone didn’t put a lot of thought into that. Best to just roll with it. 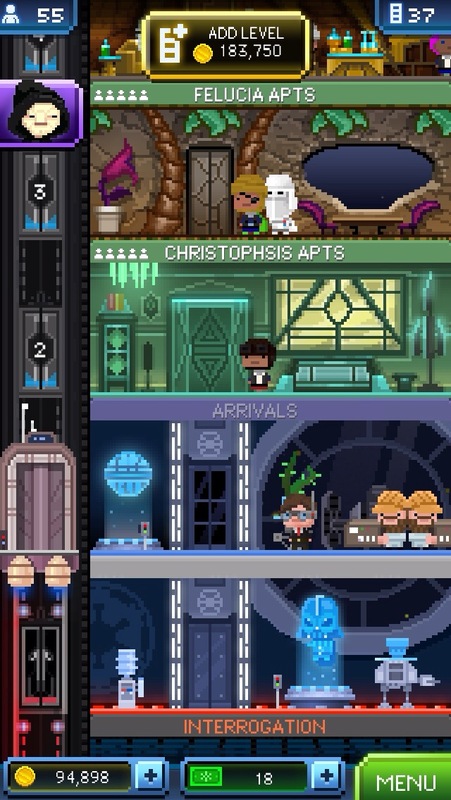 Tiny Death Star is, of course, a reskin and slight reworking of Nimblebit’s hugely popular Tiny Tower, taking the basic mechanics of building a tower block and filling it with inhabitants and things for them to buy and tweaking it for a kiddiefied version of the Star Wars universe. As such, anyone who’s played Tiny Tower will find themselves right at home. However, they may also find themselves uncomfortably constrained. The big draw of Tiny Death Star is the Star Wars ambience, and the game sprinkles it around liberally, with famous figures from the movies roaming the levels of your growing battle station, sometimes incongruously so. Fittingly, the soundtrack also consists of musak versions of famous Star Wars themes, though these soon enough grate through repetition alone. Tiny Tower’s gameplay has also been tweaked in several ways. In addition to the standard residential and commercial floors, you can also build Imperial levels, which allow you to complete missions (about which more later). Since these levels don’t make you money though, this slows down the process of building new levels, which was already slow in the original game. Of the game’s two currencies, then—credits and bux—the former, used to build and stock new floors, comes more slowly than before. Not half so slowly as bux though, which are used to buy elevator upgrades and hurry various other aspects of the game. As purchases of bux are the main form of in-app purchases the game offers, it’s understandable that Nimblebit have chosen to strangle in-game opportunities to earn them, but in doing so they’ve also strangled the sense of progress for players who don’t want to spend extra coin. Providing at least a modicum of variety to gameplay that strays close at times to Ian Bogost’s Cow Clicker (click on things to earn more things, then click on them to earn yet more things) are the missions, provided by Darth Vader and the Emperor. Both provide credits as rewards, but although the Emperor’s missions are designed to guide your construction efforts, the rewards are meagre. Vader’s missions are slightly more rewarding, but I ran into one that required me to build a specific level (the game chooses which levels in a specific category are built at random), stalling any progress in that direction. In the end, this is a Star Wars game, offered for free. If that appeals to you, go for it. But be aware that unless you’re willing to pay up, it’s going to present you with a choice between a long, hard slog and an escape route from this doomed battle station.